After a three week working sabbatical I returned hometown kick off February. I was ecstatic with the way January had gone and was looking well and truly on target for the annual goals I had set for the new year. January had yielded 145km of running and saw my 5km best drop to 25:15. Both way ahead of where I expected to be after just four weeks. The first week home included two easy mid-week runs with an interval session of seven 400’s in between. All three went well and I was even managing to break 30-minutes on my easy 5km runs. The weekend was to be a fairly solid one. Saturday was a fast 6km run which, despite a toilet stop, I completed in 34:16. It was a tough run and good to get some quality distance into my legs beyond 5km. 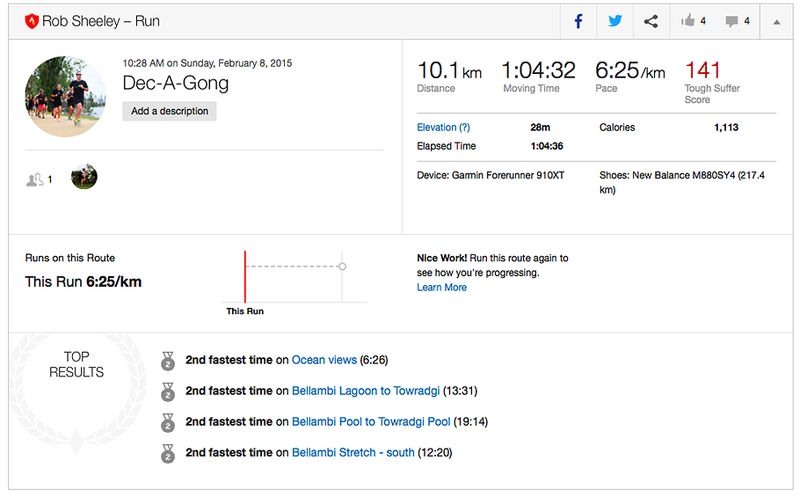 Sunday was an easy 10km run; further than I had ever run. I did it with my partner in warm conditions. It was relatively painless and I was quite content with a 1:04:32 for the trip. I felt like I could have gone further. Something else I had explored during the week was the notion of cross-training on a bike. I own an aging, cheap mountain bike which I had taken for a 16km ride. I followed that up with a similar ride on my partner’s newer road bike, it was that ride which made me make the decision to update my own and do a little bit more. I managed to pick up a brand new 2014 Jamis Xenith comp which I will have late next week.im looking forward to the diversity of riding which will hopefully also be another factor to improve my running. I also have an event to look forward to next week with a 5km track run at Olympic Park in Sydney. It is an event that encourages runners to try and set a PR with pace runners involved to allow you to see how you are going. It should be a lot of fun and, while I will not be disappointed if I cannot produce a new best, I will certainly be trying to. This week’s totals were 36.8km in 3 hours and 47 minutes with an elevation of 239 metres.